Maso Sapp’s new book “Down In the Dirty South” takes readers through some of the meanest city streets of Raleigh, North Carolina, which are unknown to the outside world. 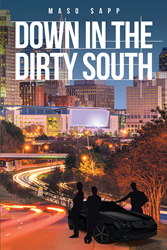 Recent release “Down In the Dirty South” from Page Publishing author Maso Sapp is the story of Tony, Dee, Shon, and E, four close friends that grew up together in the city of Raleigh. As kids they got into the life of crime, trying to escape the life of poverty that they were left with by having broken families. Maso Sapp has completed his new book “Down In the Dirty South”: a suspenseful tale about four friends who are the victims of their circumstances and are trying to succeed as best they know how. Published by New York City-based Page Publishing, Maso Sapp’s riveting work details the plight of those growing up in Raleigh in an area of crime and poverty. When Dee, one in the group of four friends, goes to prison for murder, Tony, Dee, and E meet Fernando, who helps them take their drug organization to a much larger scale. But when their old supplier by the name of Jose finds out what they have done, he brings chaos to them. Tony, who happens to be the most intelligent and intellectual one of the three, starts having mixed feelings and wants out of the life of crime he is living before something tragic happens and he loses the love of his life, Beyonka. Readers who wish to experience this exciting work can purchase“Down In the Dirty South” at bookstores everywhere, or online at the Apple iTunes store, Amazon, Google Play or Barnes and Noble.